I'm Co-Hosting a Creative Bloggers Party & Hop! I am excited about this post today! SJ from Homemaker on a Dime asked me if I would like to co-host a Creative Bloggers Party & Hop. I had participated in a couple of blog hops with my post about the Vera Bradley inspired onesie that I made at a baby shower, but I didn't think that I would ever be hosting one, but now I have the chance! I love seeing how creative people are and the stuff that they can make. I love being crafty, even if I am not that good at it :) SJ's blog Homemaker on a Dime features lots of great Do-It-Yourself projects that anyone can do and do on a budget! Plus she has great blog parties with links to a lot of great projects. Displaying the party button, though optional, is very much appreciated. Link opens up every Sunday at 5:00 pm, PST. number 1, hence giving everybody a chance to get the #1 spot. Thank to one of my readers who just emailed me the list of items that are on sale at the Outlets this weekend (through August 1)! All of the back to school essentials are an additional 20% off! What are you planning to pick up for Back to School? My Carry-all Tote and Hope Garden cards just arrived! 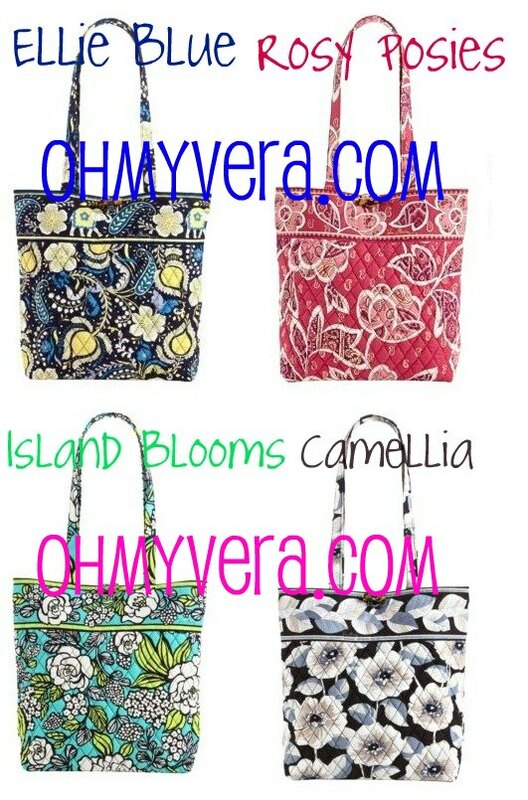 I ordered them from the online outlet on verabradley.com and went through ebates to get cash back! Happy Friday! Vera Bradley has a survey that they send out to see what people think about the new colors. They just sent out the survey for the Spring 2011 colors, but I didn't get to take the survey because by the time I got home they had already collected enough information that it didn't need to ask me the questions. Bummer. But I have a couple of friends who were able to take it and sent me a photo so that I could share it with all of you! (I can't remember how I got on the list to do to survey. Probably from making purchases online or from signing up to receive their emails.) I can't even begin to think about Spring, I havent even experienced my first DC winter yet. I am not so sure about these prints, but isnt that what I say every time? Rosy Posies does kind of intrigue me though...there are patterns in the different parts of the flower. I think that it will probably look pretty neat in person. Ellie Blue has Elephants! 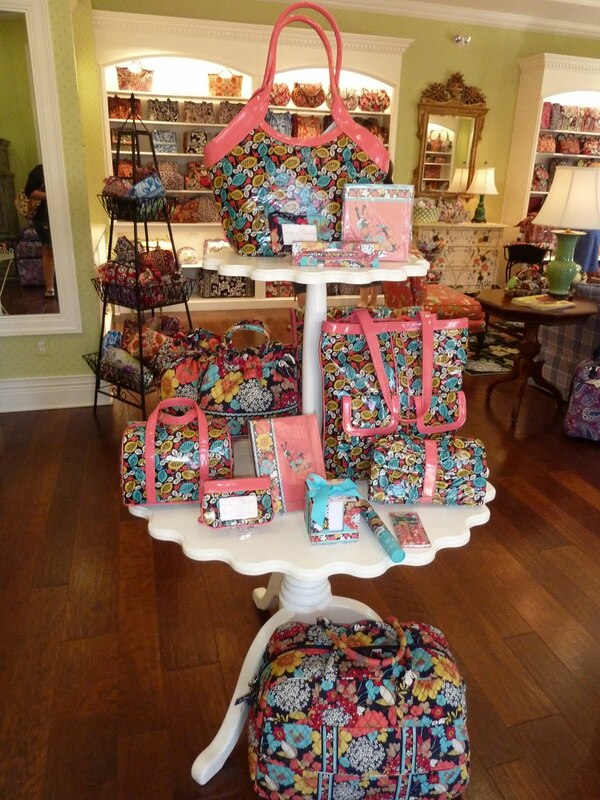 I love that Vera Bradley keeps using elephants, so fun! What color from the spring are you most looking forward to? 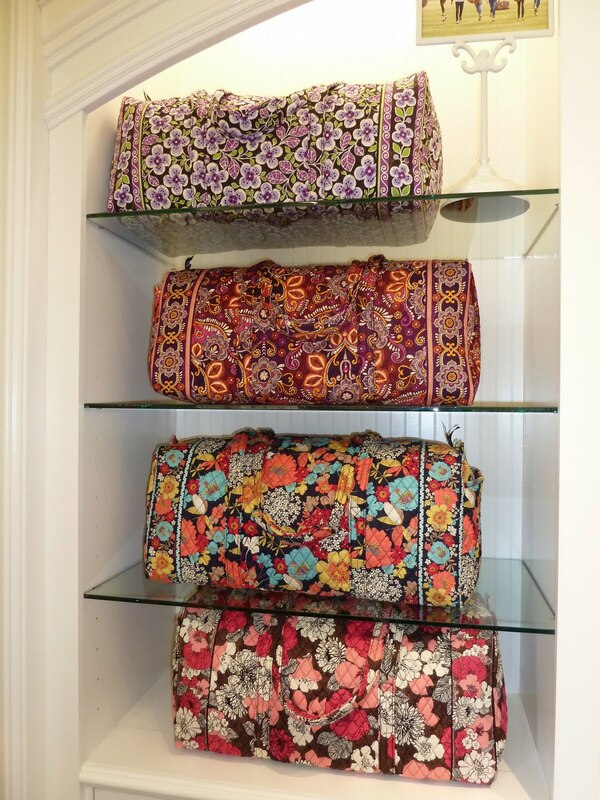 A trips worth of Vera! Last weekend I was in Northern California to go to a wedding. I always take a lot of Vera with me and this trip was no exception. The only two pieces that matched were my new 3 Pocket Tote and Double ID Wristlet in Happy Snails, the rest was a crazy assortment. You can definitely say that I am not matchy-matchy. The other bags - Metropolitan in Deco Daisy, Ditty Bag in Pinwheel Pink, Small Bow Cosmetic in Riviera Blue, Large Cosmetic in Raspberry Fizz, Jewelry Case in Pink Pansy, CLutch in Vera Vera, Tech Case in Poppy Fields. And yeah, you might have noticed that is not a Vera in the back, I didnt want to move it out of the picture, plus it is a great bag! It is an Adventure Duffel from LL Bean. It was on sale for $25!!! It is probably about the same size as a Large Duffel, but it is a medium. And I can check it and not worry about my cotton bag getting ruined! Wonderful. And it still stands out on the luggage carousel. 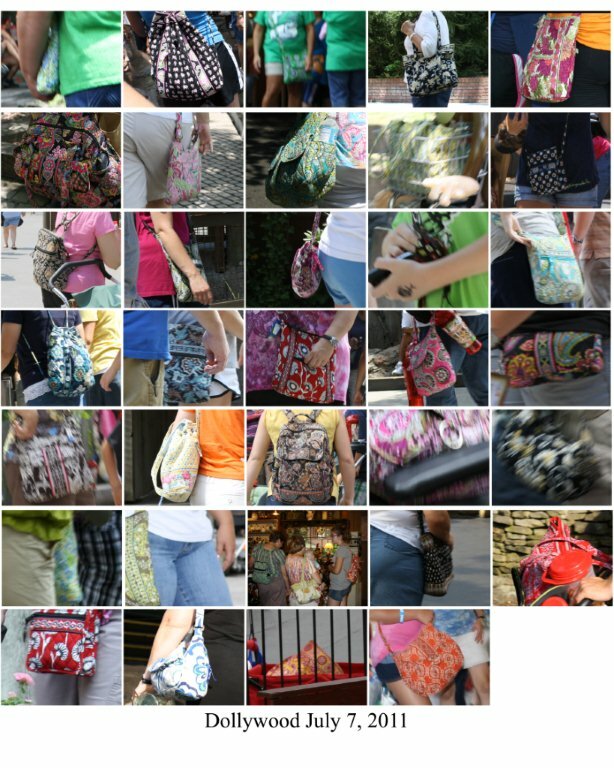 One of the questions that I get the most is why do I love Vera Bradley bags. I love them because they are colorful, fun, light, easy to take care of bags. But while I was walking through the airport I realized another reason that I have always liked Vera Bradley bags. 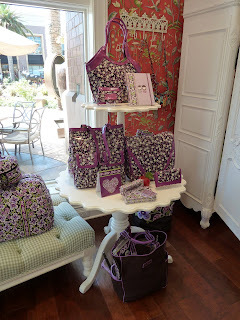 It is the same reason that Barbara and Patricia started making them...we need feminine luggage! I love that even if I am just wearing jeans and a t-shirt I can use a Vera Bradley bag and still feel feminine! Genius! I do love me some Vera! I flew to Sacramento for an extended weekend trip for my friend Tory's wedding! She got married on our college campus and it was beautiful! There was a lot to do that weekend. I got to visit with my grandma, aunts, uncles & cousins. I also got to visit my college friends too! On our way to the wedding we stopped by the mall to pick up a dress for Amber and since we were so close to the Vera Bradley store, we decided to swing by. I love the Vera Bradley store in Roseville! The store looked perfect and the women are so friendly. Check out the pictures of their displays. They have the new XL Duffels, Frill and Canvas. Look how cute the calculators are! Mocha Rouge Frill - Amber and I liked the Concert Clutch Crossbody, it is pretty cute! Happy Snails is ready for back to school! 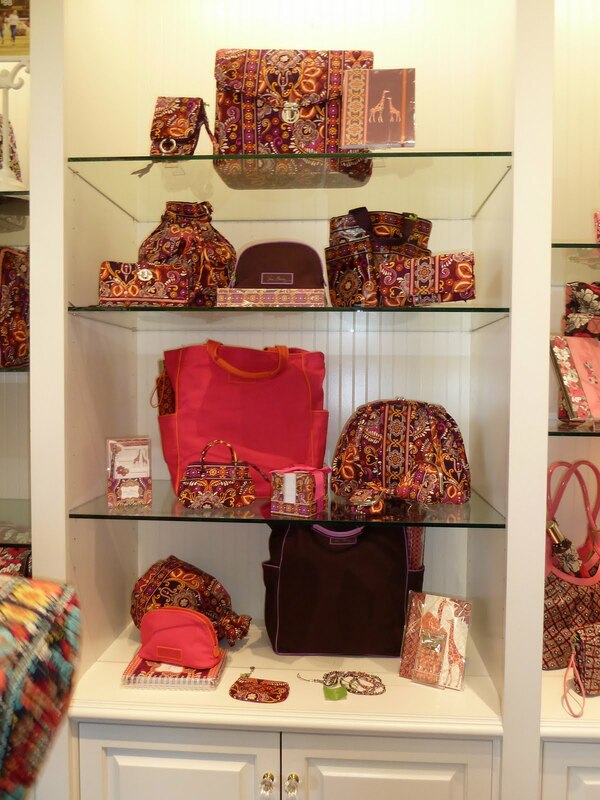 A trip to Sacramento wouldn't be complete without a visit to the Vera Bradley store in Roseville! Just window shopping though, waiting to buy the Book bag and stadium blanket! Mesa Red Handbag at the CA state Fair! I am just going to post the photos instead of having links. So now I think that there are 3 posts about these upcoming promos, but hey, third time's a charm! 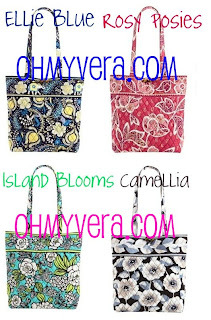 Calculator: Free with $45 Vera Bradley Stationary purchase! Want to see the other posts? Click here and click here. I know what is on my shopping list! A Happy Snails Bookbag and a Mocha Rouge Stadium Blanket! My postcard for the Vera Bradley's Birthday Celebration arrived! Enter our Grand Prize drawing for a chance to win: Overnighter, Mini Hanging Organizer, Laptop Sleeve and Double ID Wristlet. I love the cupcake on the front. I can picture that in my scrapbook someday! Vera Bradley Double ID Wristlet! Vera Bradley's Double ID Wristlet! The accessory that I never thought that I would like, haha. When I went to the Vera Bradley store a couple of weeks ago I almost got out of there without buying anything when one of the women I was shopping with showed me the Double ID Wristlet that she got. I used to have an All In One but when I got my blackberry, my phone wouldn't fit in it when it had a case on it. This Double ID Wristlet holds my phone easily! It also holds a few cards and cash, great for when I am on the go! I use it at work for lunch when I don't want to take my large bag and I used it this weekend for a street fair. Check out the pictures below to get a better look! Look at that perfect flower placement! When you open it up the smaller size has room for an ID and one card slot. The other side has a place for an ID and two card slots. I put my license on one side and my Metro card on the other. This is the short side or top flap with the metal ring. I folded my money in half for that side...didnt do such a great job folding it neatly. I also put my car key in this side. This is the larger side. More than enough room for my Blackberry Curve and a tube of ChapStick! This little wristlet is definitely going with me to California later this week! 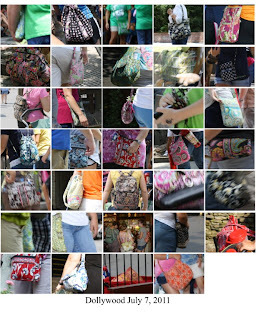 Now through Tuesday Totes are $29.99 and All In One Wristlets are $19.99 online at verabradley.com and at the outlets. Retired colors only. 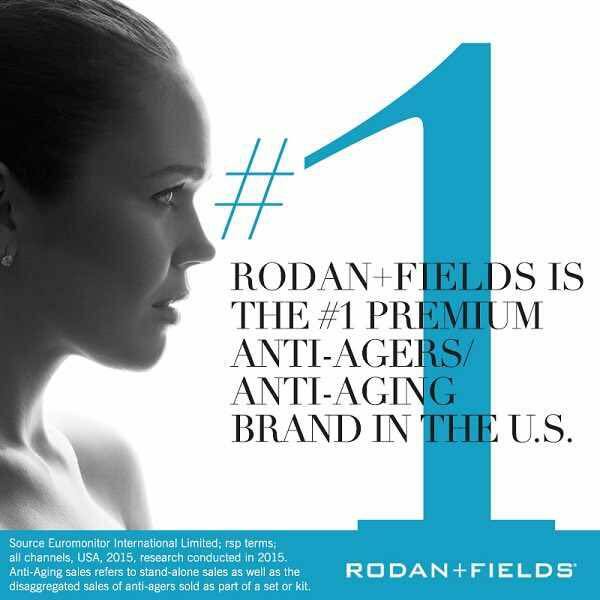 Plus free shipping on orders over $75! Check out the All In One Wristlets because they have Cupcakes Green available! Those cupcake colors are hard to come by these days!! I am at a BBQ and somehow my blog came up. We were talking about Vera Bradley and how they are quilted cotton bags and Katie ran inside to grab a bag her Mom made! The bag closes and almost snaps shut, because there is an old tape measure in there! So the bag stays securely shut! I love it! Vera Bradley needs to make a bag like this! Or Katie's mom should go into business selling them! Wow, Sarah D thanks for the Vera Sightings from Dollywood! Sarah gets sick on the rides, so she entertained herself by taking Vera Sighting photos while she waited for her family! I love all of the sightings! Frankly Scarlet small duffle. Headed to work in DC. 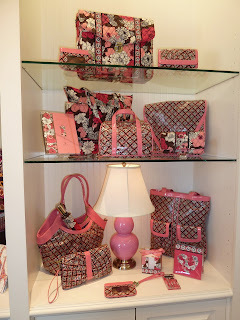 My New Vera Bradley Stuff!!! I was so excited about the Fall 2011! Didnt get much, but I am pretty happy with what I did get! Happy Snails Calendar, Gel Pens on a Lemon Parfait Towel that I picked up on sale at Hallmark! I also picked up a Product Guide...check out the next post to see the photos from that. I also have the So Me cards on the way! They were out of them at the store, so they are in the mail! Can't wait to get them! So while at the outlet over the 4th of July weekend I picked up a Lemon Parfait Knot Just a Clutch...well I got it home and decided that I really wouldnt get must use out of it. So it was off to the Signature Store for me to pick up a Converitble Tote in Navy. Good timing too, I got the last one. 40% off, woo hoo! I have wanted one since December 8th! I also ordered the 3 Pocket Tote off of QVC, too good of a deal to pass up. And lastly I bought a Double ID wristlet. I hate taking my whole tote or purse with me to grab lunch. So I am going to use this instead! While I was at the mall today I went to Hallmark and they had Product Guides available. This should answer most of your questions about what is still to come this fall! Inside cover of the guide, picture was too cute! Vera Bradley Fall 2011 Release Weekend! 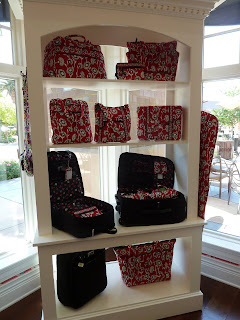 Vera Bradley Calculator and XL Duffel! Vera Bradley's Fall 2011 in Store Daily Prizes!